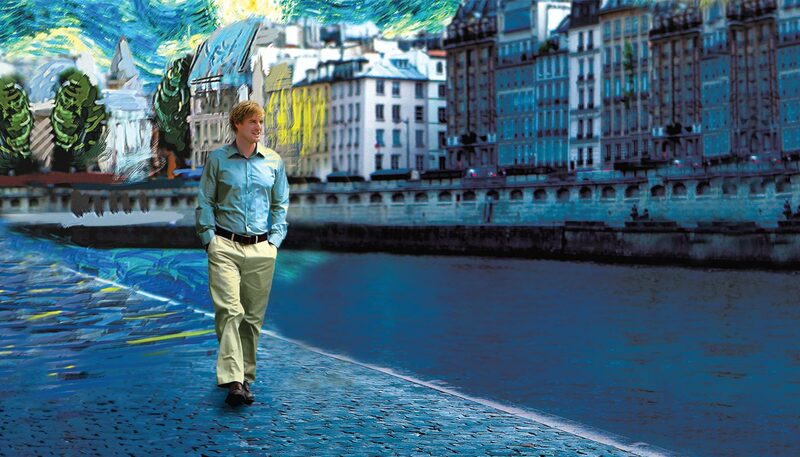 Midnight in Paris is considered a Fantasy, Romantic-Comedy Film- Directed by Woody Allen. Set in the city of love, the film follows Gil Pender. A struggling screenwriter, who is unfortunately not in the best sort of relationship with his on coming, full force, materialistic fiancée. The cast is important. You’ve got Adrien Brody (dang), Carla Bruni, Michael Sheen, Marion Cotillard, Kathy Bates, Rachel McAdams and Owen Wilson. Just take that all in. The story starts out with this young couple visiting Paris, France. The main purpose being hanging out with the rich parents of the young lady- Inez and to see the sights. Gil is completely mesmerized by the city, wanting to seriously consider moving there, convinced that the city is even more special in the rain. Inez on the other hand, wants to move to Malibu and start their life there. That there should say enough about the two main characters in the couple first scenes. The story gets interesting when Gil gets drunk one night and becomes a bit intoxicated, and thus lost on the cobble roads of Paris. A old, vintage car pulls up at the the strike of midnight and characters dressed in 1920’s wear, urges him to join them in the car. He gets in. He’s then whisked off to meet unbelievable characters, in ridiculous circumstances. Parties with well known historical figures- Gertrude Stein, Ernest Hemingway, Cole Porter, Alice B. Toklas, Picasso, F. Scott Fitzgerald among some. Being introduced and having important authors read his book. Of course he’s excited at the concept and it convinced that this maybe the place for him to stay. What about true love? Picasso’s mistress- Adriana. It was lust and eventually the real emotions. Of course, this leads into the complexities of could this relationship actually work? He was from the future, and here she was, living in the 1920’s. There was also the fact that he was set to get married sooner or later to Inez. That, and a couple other bits that come from visiting another time period- is what ends the film. What I really enjoy about this movie is how easy it was to watch. I really enjoy Owen Wilson and how laid back and it gives that vibe to the entire story. I liked the concept of going back in time too, and how he was able to bounce back and forth so easily. Just imagine if that was somewhat of a well known occurrence. I don’t think I have a specific time I’d go back to personally, but being able too just seems like a dream. +Thumbs up to whoever casted Kathy Bates as Gertrude Stein. She really played the part well, and have inspired me to learn more about the real life lady she played.